A Foundation has invited Brian Griffiths to realise The Furnace commission in Autumn 2007. Brian's practice sees the creation of fantastical scupltures based on the sticky stuff of legend. His monumental creations are portals for adventure: cardboard box space ships, garbage bin knights and bathroom caulking astronauts are all part of his repertoire. Previous works include 'Boneshaker', magical time-travelling gypsy caravan, entirely constructed from tables and hand-carved wooden ornaments found in South London antique markets. Griffiths often trades on the secret histories of these second-hand relics, using their authenticity to falsify an exotic, more 'ancient' history of his own. Another major piece, 'Beneath the Stride of Giants', realised for Camden Arts Centre saw the creation of his own personal Valhalla. 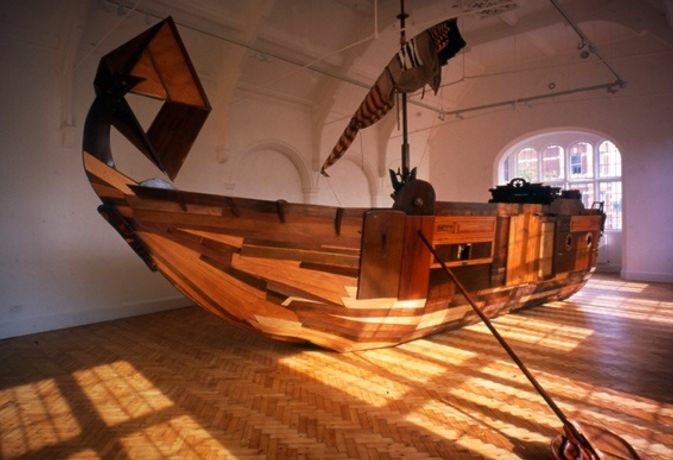 Working entirely with recycled materials, Griffith's adventure starts at second-hand furniture markets, each antique table and chiffonier is a conquest towards his ultimate campaign, his galleon is more than just a sculpture ' it's a monumental attempt to create something with real possibility. The Furnace Commission will see Griffiths creating his most ambitious piece to date. While the exact nature of the piece is currently still in development, Griffiths is keen to spend time exploring the junk-yards and second-hand furniture emporiums of Liverpool and the North West which will no doubt yeald great riches to be used in the creation of a work of fantasy and legend.